Growing up, Dr. Hollis’ family had always gone to the chiropractor. He had his first visit at age eight for a playground injury. He completed his undergraduate education at the University of New Mexico. Then, it was on to Logan College of Chiropractic in St. Louis, Missouri. It was there he met his wife Dr. Julie. Though Dr. Hollis grew up in New Mexico, he visited Texas often to see his grandma and other relatives. He fell in love with the area and knew he wanted to practice in Pflugerville. 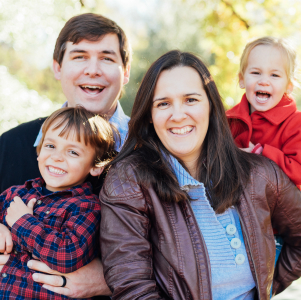 When he’s not at Central Texas Chiropractic & Rehab, Dr. Hollis stays busy with his young children, a boy and a girl. They’ve never had an earache, never taken a medication and have only been to a pediatrician for wellness visits. They spend their time going on family bike rides and going down the coast to the beach. Dr. Julie was 18 by the time she received her first chiropractic adjustment. She knew then what she wanted to do, and completed her undergraduate education at the University of North Dakota. Though she’s from Canada, family friends lived in St. Louis, Missouri and she decided to attend Logan College of Chiropractic. It was there she met Dr. Hollis. so she’s wonderful at helping patients through their first adjustment. Dr. Julie has a focus on prenatal and postnatal patients, having been selected to do an internship relating to back pain at a hospital in St. Louis. ‘’The experience made me more interested in helping the female population.” As a mother of two with one C-section birth and one natural, Dr. Julie has experienced all sides of the spectrum of delivery. She can help patients through a happier, healthier pregnancy, as well as treat many general problems such as neck and back pain or headaches. We enjoy helping all ages of patients discover optimum living. Contact us today! Saturday appointments are available.